One of my subscribers was attempting to make a letterhead template for her office. The document is fairly simple and straightforward, consisting of text only – no graphics involved. However, it came to her attention that the fonts she used in the letterhead to achieve the look she wants, are not available on all systems. If she sends the document to someone who does not have the font, then it does not look right. So she now wonders if there is a way to create a letterhead document that will look correct on other systems, whether they have the font or not. There are more than one approach you can take to getting the letterhead to work properly. The first thing you should try is to embed the fonts used in the document. Display the Word Options dialog box. 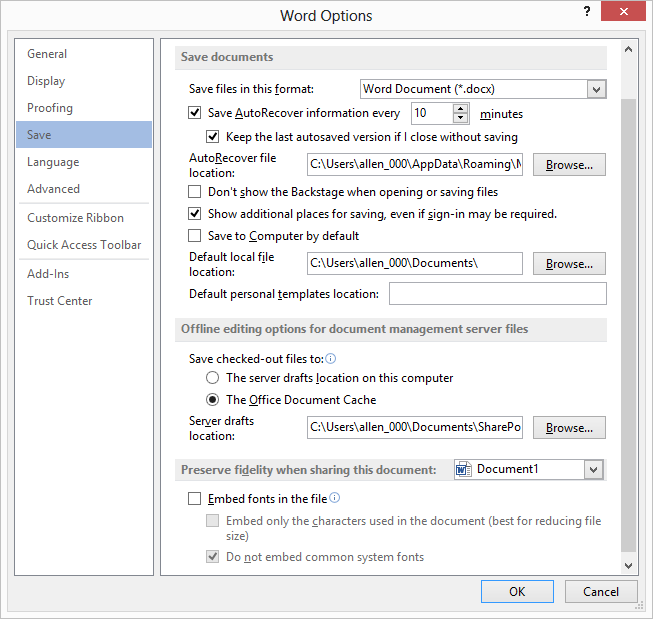 In Word 2007 click the Office button and then click Word Options. 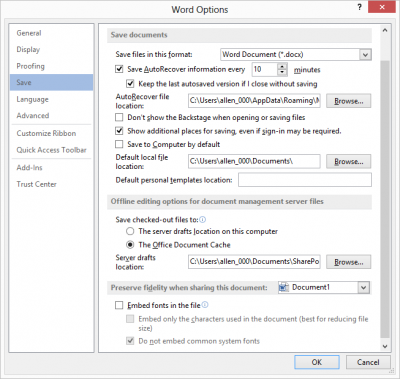 In Word 2010 and 2013, click the File tab of the ribbon and then click Options. At the left of the dialog box click Save. Be sure Embed Fonts In the File is selected. If your letterhead uses only a small number of characters in a particular font, select Embed Only the Characters Used in the Document. When next you save your letterhead document, Word will include the fonts used in the document in the file. Now, when you share the letterhead with others, they will automatically have the fonts and the letterhead will look correct. It is possible, however, that embedding fonts will not work in all instances. Some fonts are restricted by their creators, in how they can be shared. If the creator has limited what can be done with the font, then embedding it won’t really work. In that instance, you should consider changing to a different font that can be embedded in your document. If changing to a different font is not possible, you might consider doing an “end run” around the whole font issue. You could create the textual portion of your letterhead in a graphics program, save it out as a graphic, and then add the graphic to your document in Word. As a graphic, it will print correctly, regardless of the machine.